With two little girls at my house, we love pretty things…especially flowers. We routinely enjoy wearing faux flowers on hair clips. Rather than buy the flowers, I prefer to make my own. DIY satin flowers look luxurious but are really quite inexpensive. I typically fashion them out of costume satin which is fabulous because it costs less than $4/yard and comes in a variety of colors. 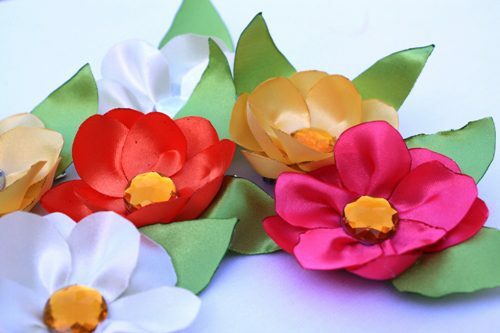 These 3-inch flowers (shown above) cost just $0.25 each to make. Not only are they inexpensive, but they are versatile too! Other Hair Accessories – In addition to using satin flowers for hairclips, you can also attach them to headbands or glue them onto an elastic hair band to create a pretty ponytail holder. Brooch – Attach a small pin to the backside of a flower to transform it into a brooch. Accessorize a blazer or top, or add a little pizzazz to an apron. Belt – Got a simple dress that needs a bit of oomph? Create a fabric belt with ribbon cut to your waist size and some Velcro sewed to the ends for the closure. Hide the ends by adding a flower on top of the closure. Throw Pillows – Glue or pin them to a throw pillow for a personalized touch. Cluster together several small flowers, or make a large one to really make a statement. Gift Wrapping Decorations – Who doesn’t love a delightfully wrapped package? Satin flowers make the wrapping extra special. Add a brooch pin to the back so that it becomes an additional gift that the recipient can use in her own special way. Fabric scissors – costume satin is slippery so you want a good pair of scissors. Fiskars are inexpensive, and they cut well! Decide on how large you’d like your flower to be, and create your templates accordingly. If you want a 3-inch flower, your petal template should be about 1.5 inches long. I prefer to use an egg-shaped template for my petals, but circles or ovals will work too. You’ll need a petal template, a circle base template and a leaf template (unless you plan to freehand the leaves). 1. 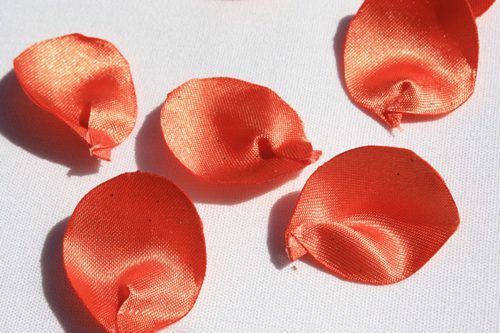 Iron your costume satin to remove any creases. 2. Trace your templates onto the satin with a pen. 3. Cut inside your tracing lines so the pen marks are not on your cut-outs. 4. Cut out 10 petals, 1 circle and 2 leaves. WARNING: Please exercise caution and common sense when using an open flame during this craft! You may wish to keep a bowl of water nearby in case you need it. 6. Apply a dab of hot glue to the base of the petal, and press to add a curve to the petal. Repeat to all of the petals. 7. 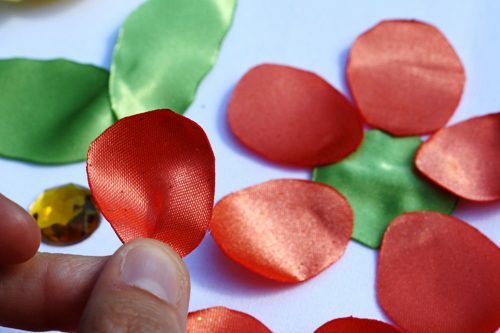 Apply a dab of glue to the back of each petal and secure to the circle base. Place 5 petals evenly spaced around your circle. 8. Offset the second layer of 5 petals, and glue them on top of the first layer. Glue the leaves to the backside of the flower. Glue your chosen embellishment to the center. Voila! 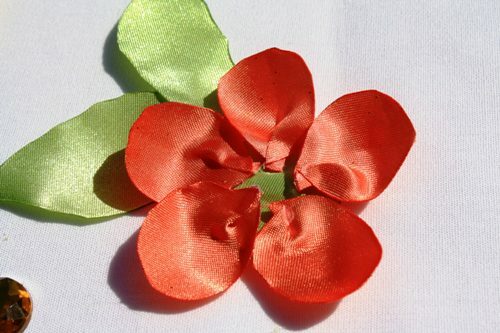 In what ways would you use satin flowers? Janel is a stay-at-home mom of two and law school wife. Raised in a budget-conscious and do-it-yourself minded family, she loves seeing something in a store or magazine and making her own version at home for less money. 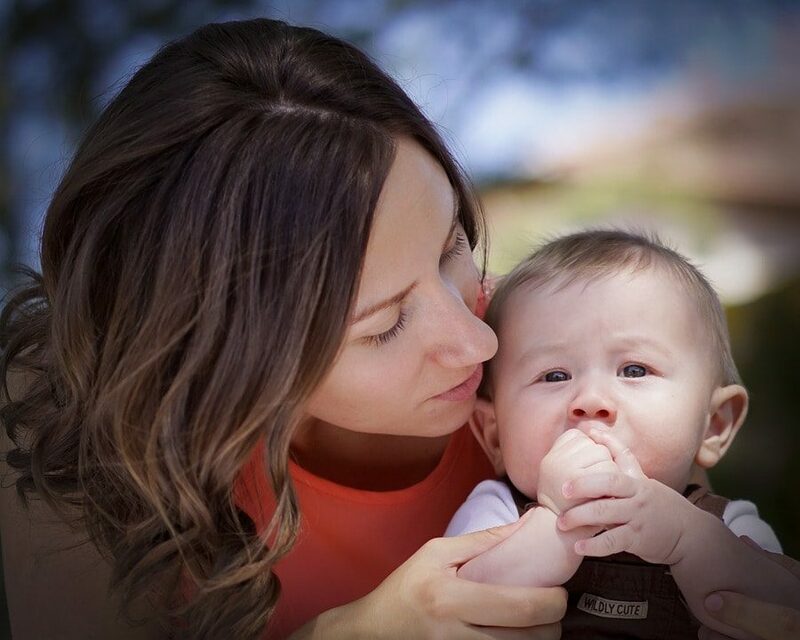 Janel blogs about motherhood, crafts and recipes at Life with Lucie and Ella.